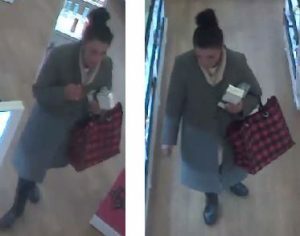 A woman stole assorted fragrance items from ULTA, located at 350 Walt Whitman Road Don December 12, at approximately 9:15 p.m. The merchandise was valued at approximately $280. She is described as white or Hispanic, approximately 25-years-old, with black hair. She was wearing a long brown jacket with a red and black colored checkered purse.